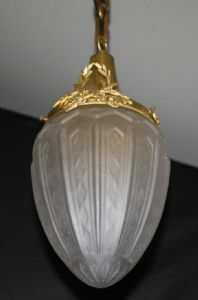 Brass framed ceiling light with glass bowl in the shape of an acorn. INCLUDING 4 link 6"(15cm) CHAIN AND 4"(10cm)CEILING CAP. BENEFITING FROM FINE SCROL AND FOLIATE DETAIL. WITH NEW THREE CORE DOUBLE INSULATED WIRE.